More than 2,400 transportation professionals learned about five innovations being promoted in the second round of Every Day Counts during virtual summits. The Federal Highway Administration used the virtual format to reach a broader audience at lower cost with information on the innovations. The spring 2013 summits, held at central locations in each state to minimize travel for participants, followed fall 2012 summits on eight technologies and practices held at eight locations around the country. Surveys showed that participants responded positively to the virtual summits. More than 90 percent gave good to excellent ratings to the overall summits and the summit format of Web conferences using multiple virtual rooms for presentations and state caucuses on innovation implementation. Every Day Counts: Building a Culture of Innovation for the 21st Century, a new FHWA report available at www.fhwa.dot.gov/innovation/everydaycounts/pdfs/edc2_2013.pdf, documents the spring 2013 and fall 2012 summits. It explains all 13 technologies and practices FHWA is promoting under EDC2 and outlines state plans for deploying them. The spring summits focused on five 21st century solutions that can shorten the project delivery process, enhance roadway safety and improve environmental sustainability. Environment summits covered two of them: geospatial data collaboration and implementing quality environmental documentation. 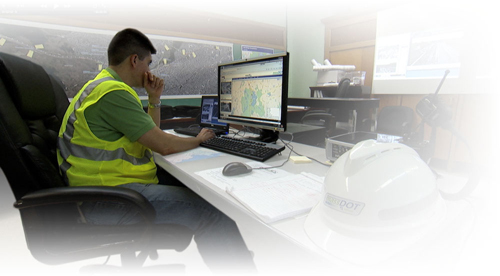 FHWA is promoting geospatial data collaboration, which uses Web-based geographic information services, to facilitate information sharing among project delivery stakeholders and improve the quality and speed of project decisions. Several states have developed GIS-based tools and are using geospatial data to support environmental streamlining efforts. The goal of the implementing quality environmental documentation effort is to expedite transportation project delivery through focused improvement in National Environmental Policy Act documentation. “Environmental documents should provide information to decision makers and the public to assess project effects and benefits. They should focus on clear issues and avoid ambiguous or opaque discussion of analysis,” said Parsons Brinckerhoff Vice President Hal Kassoff. Safety summits looked at high-friction surface treatments that use high-quality aggregates to help reduce crashes and intersection and interchange geometrics that increase safety for road users. FHWA is promoting intersection and interchange geometrics that can accommodate traffic volumes more efficiently and improve the safety of intersections, where about half of all severe crashes in the United States occur, by eliminating or relocating the intersection conflicts that can cause problems. The innovative designs also can have less impact on right-of-way acquisition and the environment than traditional designs. Operations summits dealt with national traffic incident management responder training, also a second Strategic Highway Research Program priority. 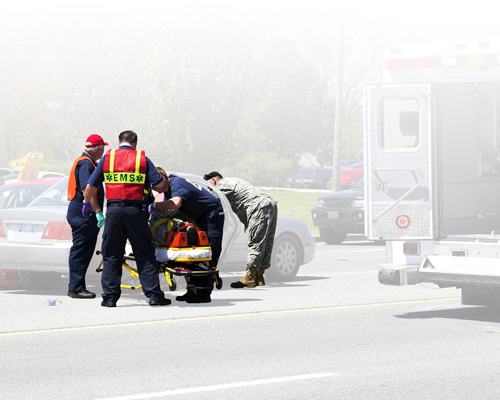 This training for first responders promotes a shared understanding of the requirements for safe, quick clearance at traffic incident scenes to protect motorists and responders while minimizing the impact on traffic flow. FHWA's focus is on deploying a train-the-trainer course for experienced incident responders—including those from police, fire, emergency medical, public safety and transportation disciplines—that facilitates widespread use of the multidisciplinary training. “Since we started the training, we have found that the interaction between the responders may be the most valuable part of the class, versus teaching only to one discipline,” said Major Barry Ross of the Oklahoma Highway Patrol. An executive-level summit for State Transportation Innovation Councils, which include leaders of highway agencies and stakeholder organizations in each state, provided an overview of all five topics. “Every Day Counts is something that will make a difference for the American people,” Bud Wright, executive director of the American Association of State Highway and Transportation Officials, told summit participants. “AASHTO and the state DOTs welcome the opportunity to collaborate on this initiative.”. For more information on EDC-2, visit www.fhwa.dot.gov/innovation/everydaycounts/edc-2.cfm. State transportation departments, local public agencies and contractors are making rapid progress on the use of accelerated bridge construction, an Every Day Counts innovation. ABC applies innovative planning, design, materials and construction methods in a safe and cost-effective way to cut on-site construction time when building or replacing a bridge. With ABC, it's possible to replace a bridge in 48 to 72 hours and reduce planning and construction efforts by years. ABC reduces traffic impacts, improves safety and can lower project costs. The Federal Highway Administration is advancing three ABC technologies under the second round of Every Day Counts: prefabricated bridge elements and systems, slide-in bridge construction and geosynthetic reinforced soil integrated bridge systems. “The PBES deployment team achieved great success during the first round of EDC,” said Timothy Cupples, FHWA's technical lead on EDC's ABC effort. “More than 800 bridges nationwide were designed or constructed with PBES during EDC-1.” PBES employs bridge components that are built off-site or near the site and are rapidly moved into position. States are planning a variety of activities to increase PBES use. The Montana Department of Transportation will build or rehabilitate at least three bridges per year over the next two years using PBES. The Hawaii DOT will investigate the use of PBES and apply ABC technologies on at least one bridge replacement project. And the District DOT plans to develop a manual on PBES connection details and design standards. The deployment team aims to build on EDC1's success in EDC2 by offering webinars, technical publications, manuals, sample plans, specifications and other products. Contact Ben Beerman at benjamin.beerman@dot.gov or visit www.fhwa.dot.gov/innovation/everydaycounts for more information. Slide-in bridge construction is a cost-effective technique for deploying PBES to quickly replace an existing bridge. A new bridge is built on temporary supports parallel to an existing bridge. Once construction is complete, the road is closed and the existing structure is demolished or slid out of the way. The new bridge is slid into place, the approaches are paved and the road is reopened in 48 to 72 hours. In a variation on this approach, Multnomah County, Oregon, successfully slid the 1,100-foot- long Sellwood Bridge into a temporary location where it will be used as a detour bridge while the new structure is built on the original alignment. Details on the project, including a time-lapse video of the bridge move, are at www.sellwoodbridge.org/. FHWA's slide-in bridge construction deployment team is developing training on this construction method. Webinars and Web-based training modules will be offered later this year, and the team is available to conduct workshops for state DOTs, local public agencies, construction contractors and engineers. Tim Cupples at timothy.cupples@dot.gov can provide more information or arrange a workshop. GRS-IBS is a construction method that combines closely spaced geosynthetic reinforcement and granular soils into a new composite material. The method is used to construct abutments and approach embankments that are less likely to settle differentially and create a bump at the end of the bridge. ABC methods such as slide-in bridge construction cut on-site construction time and help highway agencies open bridges to road users faster. Cupples said that experience in counties in Ohio and New York shows that GRS-IBS can reduce construction costs by 25 to 60 percent. A new bridge on a GRS-IBS abutment can be constructed in about two weeks. The construction is less dependent on weather conditions than conventional construction. Work can be accomplished with nonskilled labor and the system is easily modified in the field to adapt to unforeseen site conditions. This method also offers quality assurance/quality control advantages because the reinforcement is placed in lifts that are less than 12 inches (30.4 centimeters). Use of GRS-IBS is expanding. The Pennsylvania DOT plans to build a minimum of four bridges with GRS abutments. The North Carolina DOT will develop policies and practices for using GRS-IBS and pursue its use on trial projects. The Hawaii DOT has built one GRS-IBS bridge and is looking for additional opportunities. 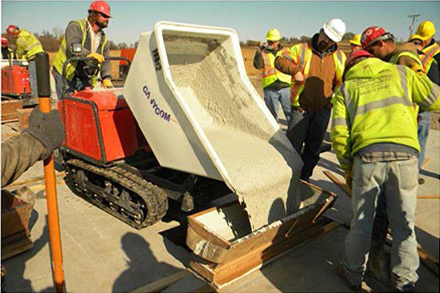 The GRS-IBS deployment team offers training on this construction method and has posted construction videos, case studies, standard drawings and more at www.fhwa.dot.gov/innovation/everydaycounts. In addition, project showcases offer design and construction professionals the opportunity to learn about the technology and witness construction of an actual GRS-IBS bridge. Daniel Alzamora at daniel.alzamora@dot.gov can provide more information. The Iowa Department of Transportation combined several accelerated bridge construction methods and innovative materials to replace a rural bridge during a 16-day closure, saving motorists months of travel disruption. Accelerated bridge construction is part of the Federal Highway Administration Every Day Counts initiative to shorten project delivery time. The project to replace a bridge on U.S. 6 over Keg Creek in Pottawattamie County was designed to increase the bridge's structural capacity, improve roadway conditions, and widen the bridge and approaching roadway to enhance safety. The Iowa DOT received a Highways for LIFE grant from FHWA to use a variety of innovations on the project. 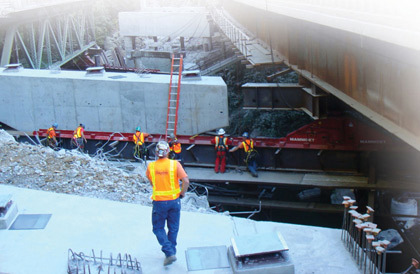 A key innovation was prefabricated bridge systems, one of the accelerated bridge construction technologies FHWA is promoting through Every Day Counts. The bridge's superstructure and substructure systems were completely prefabricated off site and installed in place, a first in Iowa. In addition, ultra-high-performance concrete was poured between the joints of the modular superstructures. Self-consolidating concrete was used to improve consolidation and increase the speed of construction of abutment piles. And fully contained flooded granular backfill was installed behind the abutments to mitigate settlement that can occur with conventionally compacted backfill. “The fact that several diverse structural systems have been assembled and incorporated into a single project reinforces the concept that innovation does not necessarily mean creating something completely new, but rather facilitating incremental improvements in a number of specific bridge details to fully leverage previously successful work,” noted an FHWA report, Iowa Demonstration Project: Accelerated Bridge Construction on U.S. 6 Over Keg Creek. Using traditional cast-in-place construction methods would have required a six-month road closure and detour to do the job, the Iowa DOT estimated, rather than the 16 days it took to remove the old bridge and install the new one with accelerated methods. As a result, the project exceeded the Highways for LIFE performance goal of reducing the time traffic is impacted by 50 percent. No traffic incidents or worker injuries were reported during the project, so it also met the Highways for LIFE goals for safety. Widening the bridge and updating the side barriers and beam guards are expected to improve future safety on the bridge. Motorists are noticing a smoother ride across the bridge than in the past, although the project did not achieve the Highways for LIFE smoothness goal. The new texture of the bridge, which is designed to aid traction and increase safety, has made the bridge somewhat noisier. In a survey, most respondents indicated overall satisfaction with the finished bridge, meeting the Highways for LIFE performance goal for user satisfaction. They also agreed that although it meant traffic delays, closing the bridge was important to complete the project quickly and minimize disruption. Using prefabricated bridge systems and innovative materials nearly doubled the cost of building the bridge compared to traditional construction, the Iowa DOT reported. But an economic analysis that included user costs showed that overall, the project cost about $440,000—or 29 percent—less than a project using conventional methods. User cost savings on the project totaled $1.6 million because the shorter bridge closure time resulted in lower vehicle operating costs and delay costs. To view a time-lapse video of the Keg Creek bridge replacement, go to www.youtube.com/watch?v=4E9VUslZUwA or scan the QR code with your mobile device. To read the Iowa report and other technical reports on Highways for LIFE demonstration projects, go to www.fhwa.dot.gov/hfl/projects. Left: Crews used prefabricated modules to shorten closure time and minimize traffic impact on an Iowa bridge project. Right: Workers poured ultra-high-performance concrete in the joints between the modular superstructure units. Marketing research can help a transportation agency better manage its resource spending by revealing what areas are most important to customers. That's especially crucial as agencies adopt and mainstream innovative technologies and practices to satisfy motorists' desire for a good driving experience. A Guide to Developing Marketing Research for Highway Innovations (FHWA-HIF-13-035), a new Federal Highway Administration publication available at www.fhwa.dot.gov/hfl/resources/market_research_guide.pdf, helps transportation agencies understand the needs, wants and values of customers. It's designed to arm agency staff—managers, marketing professionals, planners and others—with information on conducting marketing research to drive decision-making and develop more positive customer relationships. 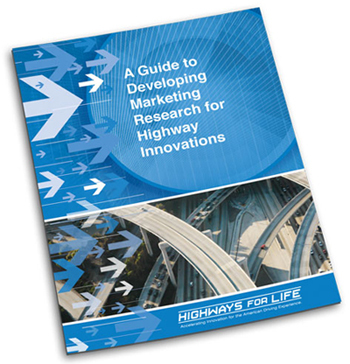 The guide provides an overview of what marketing research is and why it's relevant to the rapid deployment of highway innovations. It introduces marketing concepts and approaches and offers tips on how agencies can use the knowledge they gain through research to meet their overall service goals. It includes a list of recommended publications and resources for those who want to delve deeper into marketing research. The guide also has case studies on how highway agencies are using marketing research to make better decisions on projects, including several that used innovation to enhance safety, accelerate construction, improve quality, save money and boost customer satisfaction. The Massachusetts Department of Transportation, for example, followed up with customers after it replaced 14 bridge superstructures on Interstate 93 in one summer instead of four years. The agency got the “93 Fast 14” project done so quickly by using accelerated bridge construction techniques, prefabricated bridge elements and the design-build project delivery method. A post-construction survey found that 93 percent of respondents were somewhat to very satisfied with the condition of I-93 in the project area compared to its preconstruction condition. Nearly all indicated a strong preference for the use of accelerated bridge construction methods on the project instead of a conventional approach. The survey also found that 75 percent were very satisfied with the project-related information they received from the Massachusetts DOT and pinpointed which information sources they used most, data the agency can use in planning future projects. In another case, the Georgia DOT incorporated marketing research when it built an interchange on I-85 with prefabricated bridge elements to speed construction and cut construction-related traffic congestion. The agency set a goal of 80 percent customer satisfaction and conducted surveys at the quarter points of project completion. The first survey showed that just 65 percent of respondents were somewhat to very satisfied with the project, but those who had received information on the project were more satisfied. The agency stepped up its communication activities, including updating messages on the project hotline, mailing postcards to residents on upcoming lane closures and construction work and installing portable message signs in the project area. The final survey showed that user satisfaction had grown to 91 percent. The marketing research guide is the latest in a series of FHWA resources to help agencies deploy innovation effectively. Guide to Creating an Effective Marketing Plan outlines how to define target audiences, craft a clear value proposition and identify appropriate marketing delivery channels. “Leap Not Creep: Accelerating Innovation Implementation,” a National Highway Institute training course, provides transportation professionals with the tools to put innovations to work quickly and make them standard practice in their highway programs. Highway agencies are using Every Day Counts technologies and practices to improve how they deliver construction projects, train first responders and sustain the environment. Tennessee's governor has signed a law enabling the Tennessee Department of Transportation to conduct a construction manager/general contractor pilot program. Under the law, the agency can use the project delivery method on three challenging or technically complex projects over the next five years. The legislation calls for the agency to report to the Tennessee House and Senate Transportation Committees on the cost of each project when it's finished, the estimated and actual time of completion, and the number and value of any change orders. Transportation professionals got an up-close look at a geosynthetic reinforced soil integrated bridge system at a Delaware showcase. They visited the bridge project in New Castle County after attending a workshop on the new technology and the design, construction and monitoring plans for the bridge. The Delaware Department of Transportation plans to use GRS-IBS for applicable bridge replacement projects its maintenance forces tackle in the future. The agency already plans to use it on a location damaged by Hurricane Sandy. The Ohio Department of Transportation and the Ohio State Highway Patrol presented a Web conference on “Traffic Incident Management Train-the-Trainer: Keeping the Momentum Going.” The event featured the Ohio QuickClear program that's running in conjunction with the national traffic incident management responder training program. It also covered Ohio-specific implementation strategies to enhance program success, including senior leadership support, simple and consistent guidance, transportation and public safety partner outreach, performance measures and public awareness. Ohio plans to train 7,200 first responders by the end of 2013. North Dakota's first umbrella mitigation banking instrument will govern the operation of a statewide mitigation bank. It sets the framework for adding individual banks and reviewing specific mitigation plans. Signing the agreement were the North Dakota Department of Transportation and other North Dakota Interagency Review Team members, including the Federal Highway Administration, U.S. Army Corps of Engineers, U.S. Environmental Protection Agency, U.S. Fish and Wildlife Service, Natural Resources Conservation Service and North Dakota Game and Fish Department. The Center for Accelerating Innovation plans to transition Innovator, the Federal Highway Administration's source for innovation news, from a print publication to an all-electronic newsletter. In the not-too-distant future, readers will be able to view the new Innovator online on their preferred devices as well as download and print their own copy. Since 2007, the newsletter has brought readers information on how the highway community is using proven innovations to build infrastructure better and the assistance and resources FHWA offers to help them do it. Moving the newsletter from print to electronic will allow the inclusion of enhanced content, such as videos, slide shows, 3-D images, animations and links to more detailed information on innovations. Digital publication will also save printing and mailing costs and time, enabling FHWA to get the latest innovation news to subscribers faster while minimizing the environmental impacts of paper publication. Surveys show that as more people get accustomed to reading news online, they prefer that delivery method. Nearly half of all Americans now get their news digitally, according to the Pew Research Center's 2012 Media Consumption Survey. Make sure you don't miss an issue by signing up for e-mail notifications at https://public.govdelivery.com/accounts/USDOTHFL/subscriber/new?topic_id=USDOTHFL_12&pop=t. Accelerated bridge construction technologies will enable the New York State Department of Transportation to replace superstructures for two bridges on a valuable trade corridor in two 72-hour windows, minimizing the effect on traffic. The project, which received a Highways for LIFE grant from the Federal Highway Administration to use innovation, is a bridge replacement in Niagara Falls on a section of I-190 near the U.S.-Canada border that carries 45,000 vehicles per day, 17 percent of them trucks. ABC is one of FHWA's Every Day Counts innovations. Construction has begun on the $7.74 million project, and substructure work will be completed in 2013 under the existing structures. I-190 traffic will not be impacted by the bridge replacement this year. “We plan to complete superstructure work during two 72-hour—or less—windows next year,” said Cameron B. Schulz, senior design engineer with the New York State DOT. The existing bridges are three-span, simply supported, multi-girder steel bridges. The new bridges will reduce each bridge to one span. That way, four spans and four bridge joints are eliminated, along with the long-term maintenance costs for those features. The project incorporates precast modular deck beams into the bridge replacement. Each modular deck beam consists of a prefabricated unit of two steel girders precast to a concrete deck section. Benefits of the modular deck beams include structural longitudinal joints between beams, even steel girder spacing and allowance for future deck replacements. Once the units are placed, they require only structural closure pours to connect the units and installation of a waterproof membrane and an asphalt wearing surface. The concrete barrier will also be precast onto the fascia beams, which eliminates the need for cast-in-place and cure times after the beams are installed. The modular deck beam allows the New York State DOT to use the ABC approach. Under the traditional approach, highway users would be impacted for about three months per structure. During the 72-hour work windows, traffic will be maintained using exit and entrance ramps at Buffalo Avenue. Using ABC methods will give highway workers and motorists 97 percent less exposure to hazards and delays than a traditional work zone would. The aggregate travel time increase for each vehicle will be less than 3 percent when compared to conventional construction—well within the Highways for LIFE performance goal of 10 percent. The modular deck beams provide the advantage of precast over cast-in-place construction. The precast units will be made in a controlled environment with tight fabrication tolerances. They won't be subject to weather conditions and traffic vibrations throughout placement and cure times as cast-in-place material would be. 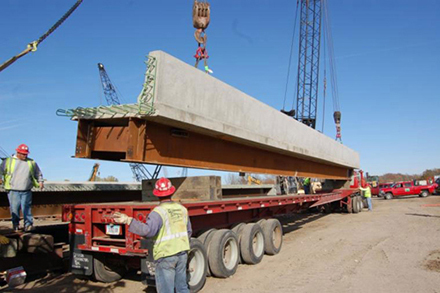 The modular deck beam is expected to be fabricated with a high-strength concrete, which has lower permeability than conventional cast-in-place concrete and is more durable. One of the innovative technologies planned for the project is the iCone, a standard channelizing traffic barrel equipped with a radar gun, GPS antenna, cellular modem and battery. Using its cellular connection to the Internet, the iCone relays data to the iCone website (www.iconetraffic.com), where current traffic conditions can be monitored by the Regional Traffic Operations Center. Speed data obtained from the iCones can be interpreted to account for queuing or incidents in the work zone. Alerts, via e-mail or text message, will notify the Regional Traffic Operations Center and the contractor's superintendent of possible incidents. The center can then verify traffic conditions through traffic cameras in the project area and warn motorists, by adjusting messages on variable message signs, of potential stopped vehicles in the roadway. Using precast modular deck beams will significantly reduce the impact of a New York bridge replacement project on vehicles traveling a U.S.-Canada trade corridor.